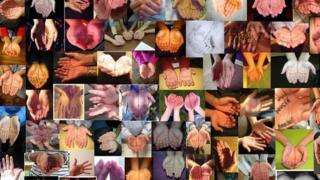 An artist is hoping to photograph 11 million pairs of hands as part of a Holocaust memorial project. Franceska McCullough, 39, who lives in St Albans, Hertfordshire, wanted to commemorate those who died in Nazi concentration camps. She said she wanted the project to "bring communities together" and get people to unite through their differences, rather than divide. So far, she has collected 1,891 photos, each representing a lost life. "My project is about humanizing an incomprehensible number," she said. "Our hands tell the story of the life we've led so far. It makes it more human." One of those whose hands form part of the project is Robbie Clark, 96, who was forced to walk more than 1,000 miles (1,600km) across Eastern Europe by German captors. Ms McCullough said she wanted to go to schools and tell them about what she was doing, to "teach peace and equality to the younger generation". She added she had not set a deadline for when she wanted the project to be complete, but would "like it to be within the lifetime of someone who survived the Holocaust".